So... Have you ever wondered how that Lightning Storm combo deck kills you? Well, you are in the right place. Competitive Ad Nauseam, my primary and favorite modern deck, I play Ad Nauseam pretty religiously I will admit, however I have never stopped loving it. I was drawn to it mainly due to the fact that I am a Latinist, so in many ways it bridges the gap for me between two of my main interests. Resolve Ad Nauseam after having cast Angel's Grace or with Phyrexian Unlife active, this allows us to go into negative life totals upon casting Ad Nauseam which notably involves "lose of life" as opposed to "damage", two terms that are not synonymous with each other (see rule 118.2 and 119.3a). Becasuse of this technicality, upon resolving Ad Nauseam we simply draw our deck, exile three Monkeys for and use this to cast Lightning Storm maintaining priority and discarding enough lands to kill our opponent. Alternatively, with the availability of Laboratory Maniac followed by Serum Visions is our other route to victory. These three cards; 4 copies of Ad Nauseam , 4 copies of Angel's Grace , and 3-4 copies of Phyrexian Unlife ; constitute the core of the combo outlined above. The basic idea, once again, is to cast Ad Nauseam with either Phyrexian Unlife on the field or Angel's Grace 's effect active. One will note that the deck has significantly more enablers than Ad Nauseam itself to provide redundancy, however one must then take into consideration what this means when playing the deck. Because of this distribution Ad Nauseam is logically harder to find and should be prioritized in your hand, in other words if opponent ticks up Liliana of the Veil and your hand is Angel's Grace and Ad Nauseam then 9/10 it is correct to discard the Angel's Grace . A further note on the enablers: Angel's Grace , owing to the fact that it is near-impossible to interact with, is the "better" of the two and, if possible, is the preferred option. 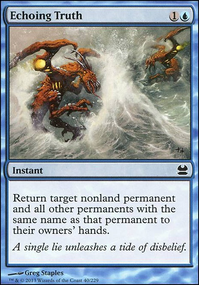 Note that it is an instant enabling the deck to win at instant speed with both Ad Nauseam and Lightning Storm also being instants. Phyrexian Unlife has one advantage over Angel's Grace in that, if the situation arises, for example against Lantern Control after Lightning Storm has been named with Pithing Needle , Ad Nauseam can be cast and resolved leaving one card in your library to draw on your next turn (this play should be done on your opponent's end step) allowing for the Laboratory Maniac win the next turn with access to all your untapped mana and deck in hand. Notably Angel's Grace can not do this as the moment the turn is passed we lose as a state-based action for having less than 0 life. With Phyrexian Unlife however, this does not matter as the enchantment is removing this action; although if our opponent removed the Phyrexian Unlife we lose on the spot. This situation is exceedingly rare and I personally have only had it come up twice, once against the aforementioned Lantern Control and once against Bogles. These represent both my own preferred wincons and the wincons that have become the commonly agreed stock. 1-2 Lightning Storm : The preferred wincon of the deck, with Ad Nauseam drawing our whole deck one has, by coincidence, all of their lands in hand to feed Lightning Storm . 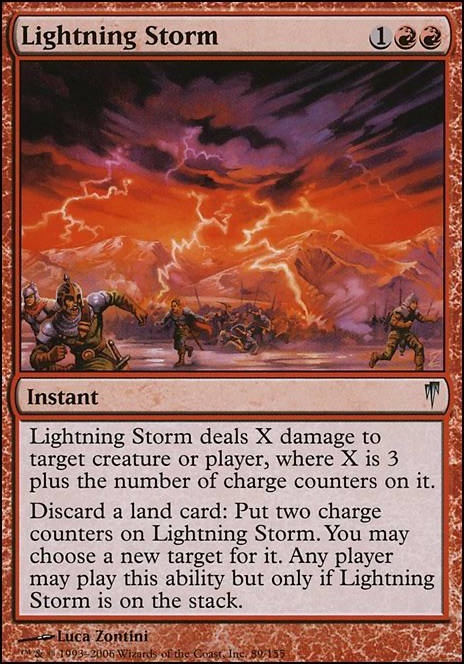 As explained above, to cast Lightning Storm the most common method is to simply exile 3 Monkeys , although occasionally when this isn't possible remember if comboing on your turn that you have a land-drop. When playing Lightning Storm you MUST maintain priority, if you do not maintain priority your opponent can simply say that they elect not to add any counters to Lightning Storm and then it will resolve only dealing 3 damage. To maintain priority in paper announce when you cast the card that this is what you are doing, on MTGO hold CTRL when casting the Lightning Storm . 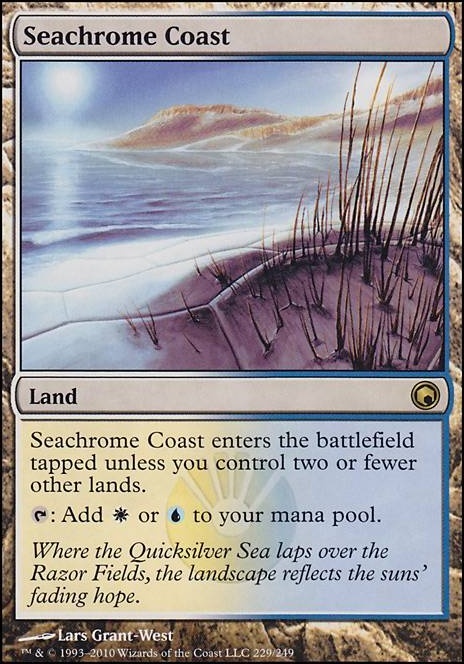 Moreover, when adding counters to Lightning Storm NEVER add more damage than is needed to kill your opponent at that moment, there is always the possibility that your opponent has a land in hand or if they respond by gaining life you can simply discard more lands. 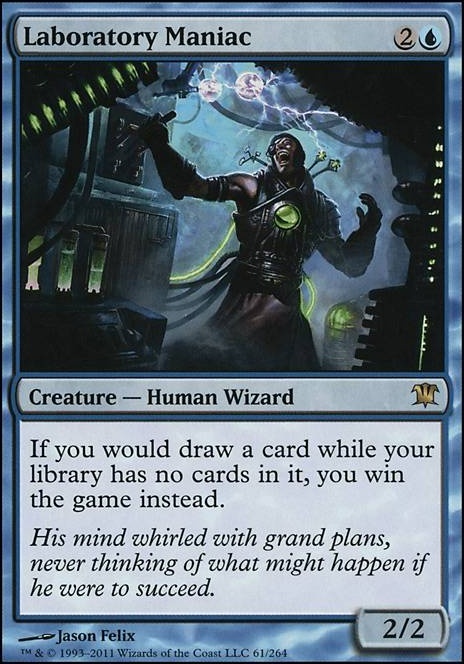 The second wincon of the deck comes in the form of Laboratory Maniac . The basic premise, as outlined above once again, is to have Laboratory Maniac on the field and then cast Serum Visions . To this end there are two scenarios where this win comes into play. The first, and by far most common, is to win with Laboratory Maniac as part of the Ad Nauseam combo. Doing this requires one more mana than winning with the aforementioned Lightning Storm does and two of that mana has to be . There are two ways to create this mana, option A is to already have an untapped source on the field, or the ability to play a land after resolving Ad Nauseam . In this scenario, one taps the source and exiles 2 Monkeys to cast Laboratory Maniac , then the other 2 Monkeys to play a Pentad Prism on 1, removing the counter for and casting Serum Visions . 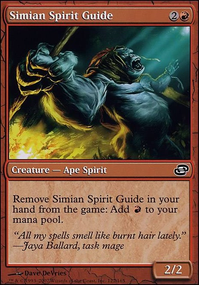 Alternatively, with any land one can tap it and exile a Monkey to play a Pentad Prism on 2, then remove one counter for and exile 2 Monkeys to cast Laboratory Maniac and removing the last counter to cast Serum Visions . Either way the result is the same. Also worth noting is that if you are playing 2 Desperate Ritual in your 75 then the Laboratory Maniac win can be pulled off on turn 4 with the availability of Lotus Bloom if you had missed a land-drop like Lightning Storm as you will have the ability to create 6 and filter 4 of it into 2 with Pentad Prism , however in my opinion this is not a sound reason to be playing Desperate Ritual . The second, and by far rarer, way to win with Laboratory Maniac can pop out of nowhere. 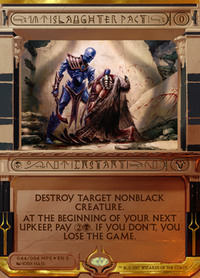 Commonly referred to as the Spoils of the Vault kill, the idea is that with either Angel's Grace or Phyrexian Unlife active and Laboratory Maniac on the field. If, in hand, one has Spoils of the Vault , Serum Visions , or alternatively 2 Spoils of the Vault , then a win can be pulled off on the spot. For sake of example, let's say that both Spoils of the Vault and Serum Visions are in hand. With Laboratory Maniac on the field and available, one starts by casting Spoils of the Vault naming a card that is not in the deck, I usually go with Rowdy Crew , exiling the entire deck and putting one's life total to negatives; after this cast Serum Visions to win with the Laboratory Maniac . With 2 Spoils of the Vault , first tutor for the piece of this kill missing, and use the second to exile your deck. 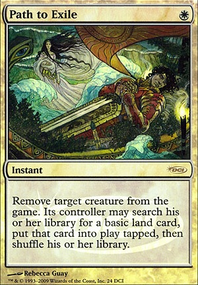 While a fun and interesting kill, this should never be your first option as, unlike the primary combo, this is very easy to disrupt, if playing Ad Nauseam is a possibility, or you are not dead next turn, then wait, however if the opportunity presents itself and opponent is tapped out then the Spoils of the Vault kill is an option to be aware of and is more common than one would likely imagine. 0-3 Peer Through Depths : This is a card that has fallen out of favor in recent years since its initial inclusion in Ad Nauseam. The effect itself is powerful and very likely to hit what you need, however that is the problem with the card, it is simply "likely" to hit as opposed to Spoils of the Vault which has come to replace it. Regardless of it's falling out of favor the effect remains powerful and is recommended to players just picking up Ad Nauseam for the first time. The appeal to Peer Through Depths is that it is not nearly as random as Spoils of the Vault and cannot kill you on the spot. Spoils of the Vault is by far harder to know how to play and can be frustrating to new players when it exiles all the wincons from the deck (this will happen from time to time). Peer Through Depths is thusly a great beginner option that can still be played once one has garnered a ton of experience with the deck. 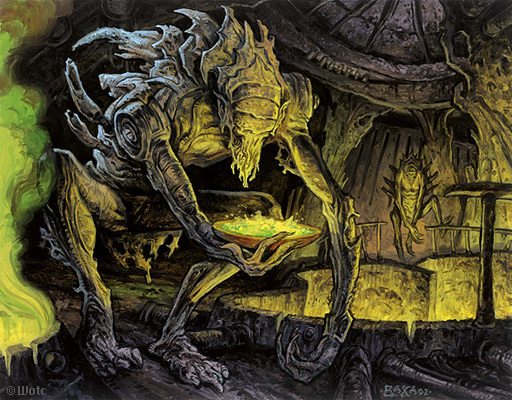 Personally I do not play it as the flexibility of Spoils of the Vault appeals to me more, however that is by no means a knock to Peer Through Depths which shines in the right build. 3-4 Sleight of Hand : Of the two cantrips in the deck Sleight of Hand is the worse of the two, hence why it is possible to occasionally see lists running only 3 as opposed to the playset. 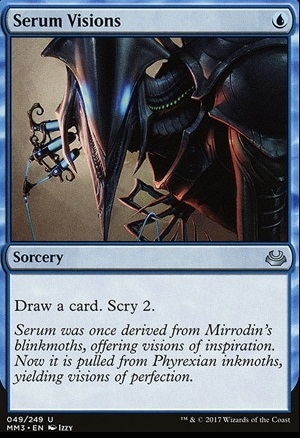 The lack of a scry and its only digging two deep makes Serum Visions the better cantrip as the game goes on. 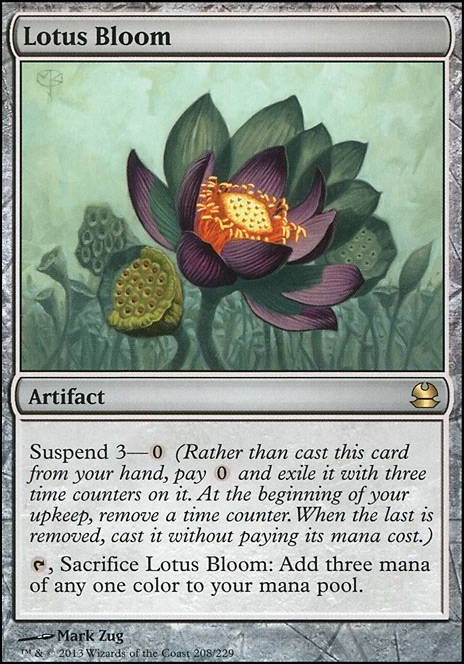 On turn one however, Sleight of Hand is the preferred option as it gives one the greatest possibility of hitting a turn 1 Lotus Bloom . Whereas Serum Visions has to draw Lotus Bloom , Sleight of Hand offers a choice of 2 cards making finding the all important mana acceleration slightly easier. 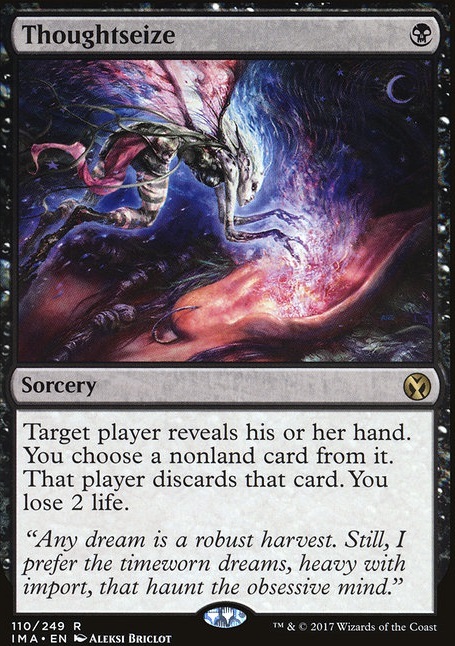 Additionally, in regards to sequencing cantrips, it is always correct to Sleight of Hand prior to Serum Visions so as not to disrupt the scry of the latter, and to this end to play Sleight of Hand prior to playing a scry land , again to preserve the scry and dig as deep as possible in search of the combo pieces needed to win. 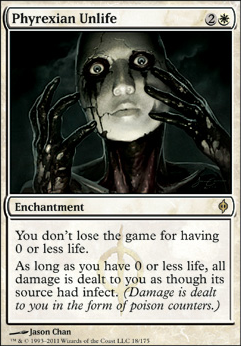 Also notably, Sleight of Hand does not work with the Laboratory Maniac win as you never actually draw a card. 4 Serum Visions : In addition to enabling the Laboratory Maniac win as outlined above, Serum Visions is the best blue cantrip in the modern format, and that does not change here. 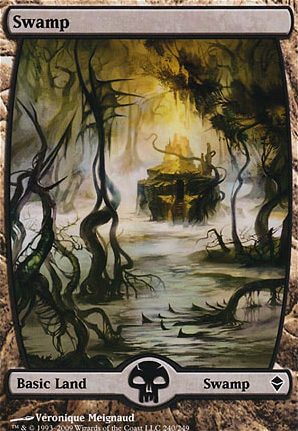 The playset is mandatory for the deck as it provides the ability to dig three deep in pursuit of the combo. As a note on sequencing, if possible, always play Serum Visions after a scry land to set up the draw, and in the worst case scenario, dig four deep instead of only three, a significant difference as digging four deep is equivalent to seeing 6.6667% of a 60 card deck whereas three deep is 5%. 0-3 Spoils of the Vault : In the lifetime of Ad Nauseam, Spoils of the Vault is comparably a newer addition to the deck, however it has proven to be by far the perfect card. The drawback itself is often inconsequential as when one casts Spoils of the Vault the intent is often to win, protect the win, or set up the win. 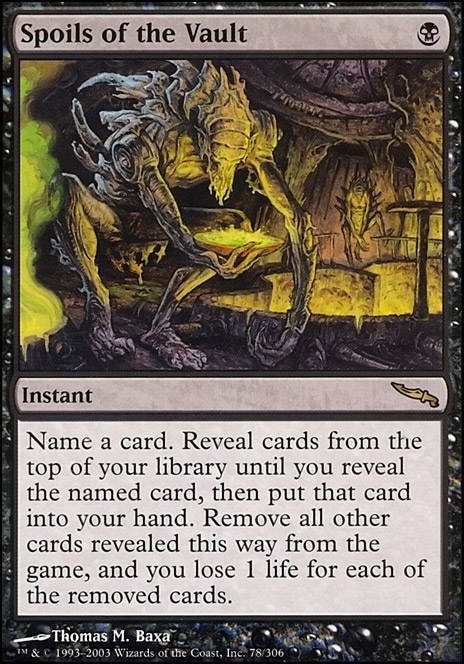 In other words, it is very rare that casting Spoils of the Vault blind is the only option available, however, even then the card has an appeal to it, allowing the Ad Nauseam player to set up a win out of nowhere. With Angel's Grace or Phyrexian Unlife active the drawback of Spoils of the Vault is a non-issue, and from experience it is not uncommon to tutor for a Pact of Negation to counter a Cryptic Command for example targeting your game-winning Ad Nauseam . With all this said Spoils of the Vault can be very frustrating owing to its randomness. Usually, one should wait until they have at least one combo piece in hand and have put at least one wincon to the bottom before casting this card. 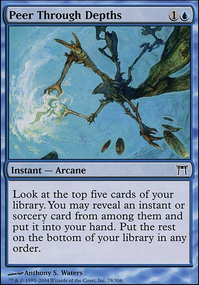 Moreover, an interaction that is sometimes lost on newer players is that with Serum Visions or a scry land , it is possible to set up a Spoils of the Vault to essentially work as an extra draw by tutoring for the card put on top; this can come in handy, allowing us to see two cards instead of one in some spots. 0-1 Mystical Teachings : Personally, I am an advocate for the inclusion of Mystical Teachings in Ad Nauseam. The card does everything we want it to do, often in control matchups providing much needed redundancy and flexibility to the deck that is not as painful or random as Spoils of the Vault . In addition to any combo piece, out of the board, if you so chose to play them, it can grab Teferi, Mage of Zhalfir as well as Vendilion Clique ; both solid options, Teferi, Mage of Zhalfir in particular being great in a control heavy meta. I would never not have a copy in my 75, however to those picking up the deck who consistently play more aggressive decks on a regular basis and do not face much control, 3 Spoils of the Vault is a fine option. 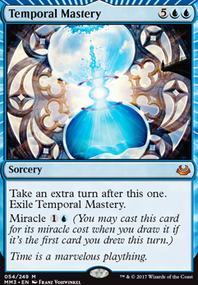 Also note that one should never run more than 1 Mystical Teachings , its high cost is a bit too ambitious in multiples for the deck. The basics used in the deck vary from player to player, some will argue that 2 Plains is the most important as the only relevant cards in the deck that you must cast are Angel's Grace and Phyrexian Unlife . While I understand this argument, I do not put it into practice as I find it too focused on the points where you have the combo. As of writing this I am playing one of each relevant basic, not because I think this the best split, but because I matchup against Blood Moon on a regular basis, if this was not the case I would be running 2 Island and 1 Plains as I believe it is important to have as many possible lands to cantrip on turn one. 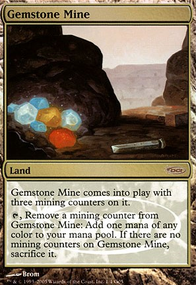 The five color sources for the deck, these are, in terms of just creating mana, the most important lands in the deck. 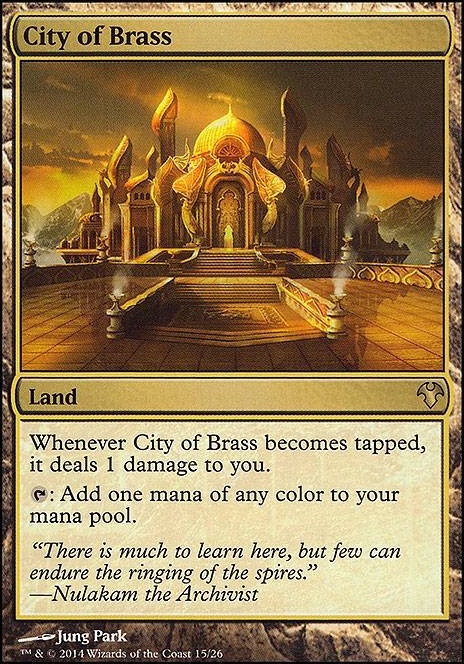 One should have a combined total of at least 5 in their deck at all times, the split is up to you however, in a meta of control City of Brass tends to be better, against more aggressive decks Gemstone Mine tends to be better. 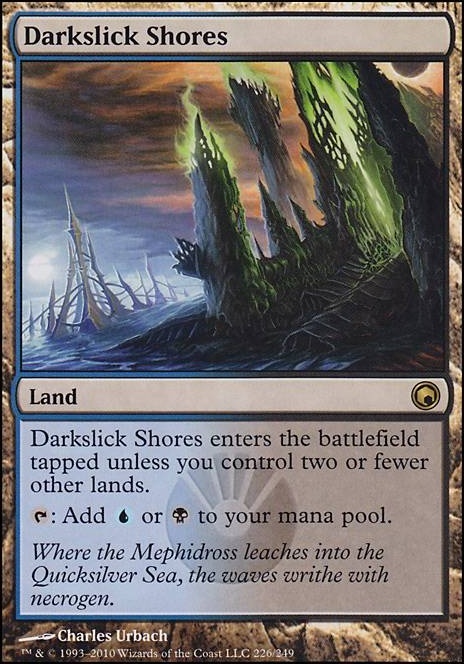 In a deck where one does not generally play more than 3 lands in a single game Darkslick Shores and Seachrome Coast essentially function in this deck as Underground Sea and Tundra respectively. Outside of grindier matchups, and even occasionally still then, going past three lands (bar a scry land or a utility land ) is not in our best interest. 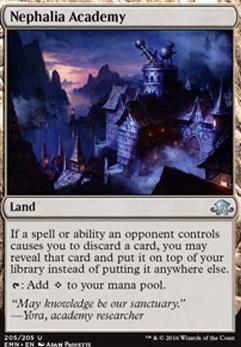 That makes the fast lands perfect for this deck as the draw back is very rarely relevant to us. A note on quantities, while I have seen players play as low as 1 of each, I believe this to be incorrect due to the efficiency they have in this deck and would recommend 2-3 of each dependent on the number of 5-color sources you wish to play. 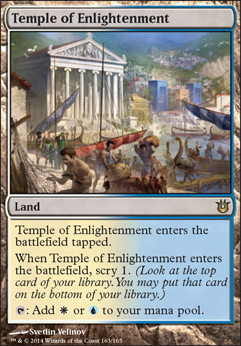 On turn one, while it is tempting to play the Seachrome Coast and cast a cantrip, there is no guarantee that you will hit another land or Lotus Bloom , and if you do not hit a land you cannot play Pentad Prism on turn two. 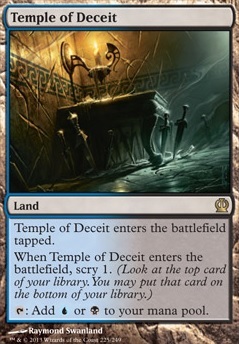 To this end it is correct to play the Temple of Deceit first, taking the scry and setting yourself up to play Pentad Prism on turn 2 which, depending on your hand can enable a turn 3 win with a Monkey (for the hand above drawing one more land would yield a turn 3 win). To say it simply, prioritize what you have in your hand, our goal is to get to 5-6 mana as quickly as possible, playing Pentad Prism on turn three is sometimes too late and can disrupt an on-curve Phyrexian Unlife regardless. These represent the various utility lands one can play in Ad Nauseam to their own liking, I will go through them sequentially. Firstly, Nephalia Academy is a card that sees very fringe play, although it can be useful. The effect itself is that of a Library of Leng , and against discard heavy decks like Jund or Grixis Death's Shadow can be useful. The problem with it is that the effect replaces your draw, not to mention how painful it is to see it disrupting playing Pentad Prism on turn 2. 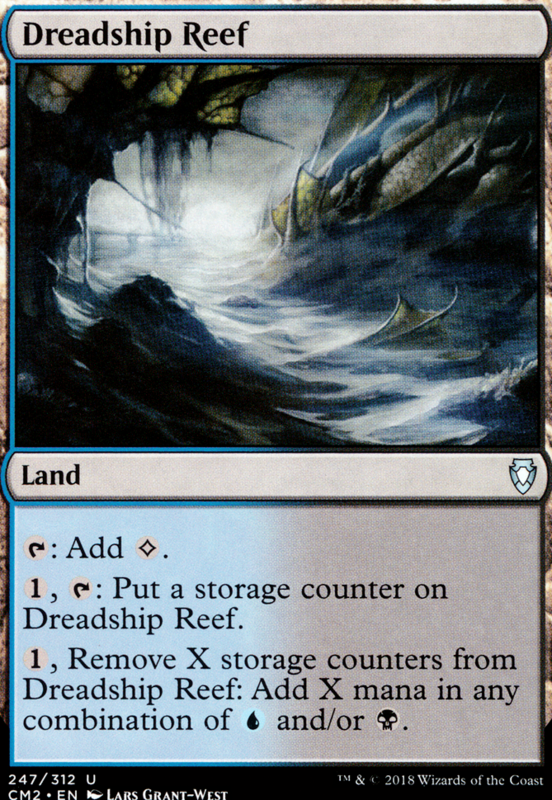 Dreadship Reef is a card that sees moderate play however I personally hate it. It again messes up the Pentad Prism math, and ever since the printing of Field of Ruin has been, in my opinion, obsolete. The investment is high and modern control now has a tool where, unlike before, they don't lose a land for dealing with the Dreadship Reef , others will tell you that Dreadship Reef is great, however I have always found it to be a wasted slot where I would rather have a coloured source, the matchups it is good in are now prepared to deal with it, and after that it too often can slow us down. Boseiju, Who Shelters All has suffered the same problem as Dreadship Reef , where it used to be acceptable to play it in the sideboard, Field of Ruin has rendered it fundamentally useless in many situations, the redeeming quality for Boseiju, Who Shelters All as opposed to Dreadship Reef is that it HAS to be dealt with or we will win, but regardless it is unfortunately hard to justify playing while Field of Ruin is popular. Urborg, Tomb of Yawgmoth is a fine card to play. 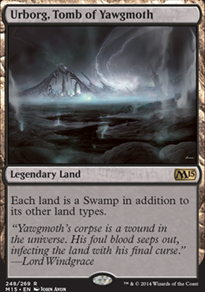 It's biggest downside is that it does not really add anything to the deck, our mana is generally fine so Urborg, Tomb of Yawgmoth can feel surplus to requirements at times; this one would be left to personal preference of the pilot. 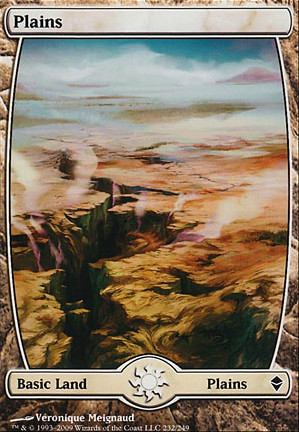 Polluted Delta used to be in the stock Ad Nuaseam manabase, however with the move towards Spoils of the Vault has fallen out of favor. The two cards do not play well together as often before casting Spoils of the Vault one is putting valuable cards like Lightning Storm to the bottom of the deck, Polluted Delta would cause us to shuffle which isn't ideal considering, unlike Mystical Teachings , we are not getting a combo piece or something else needed. 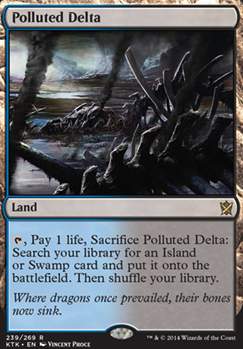 If you are not playing Spoils of the Vault and instead are playing Peer Through Depths however, then Polluted Delta can be very good, providing a shuffle after putting potentially relevant cards to the bottom with Peer Through Depths . All of the above cards are absolutely necessary for the deck, with each providing the mana necessary to win. To wait for 6 lands in modern is both unrealistic and a virtual death sentence. To combat this enter Pentad Prism and Lotus Bloom , with Pentad Prism providing a rare but possible turn 3 win, and both allowing the deck to win consistently on turn 4. 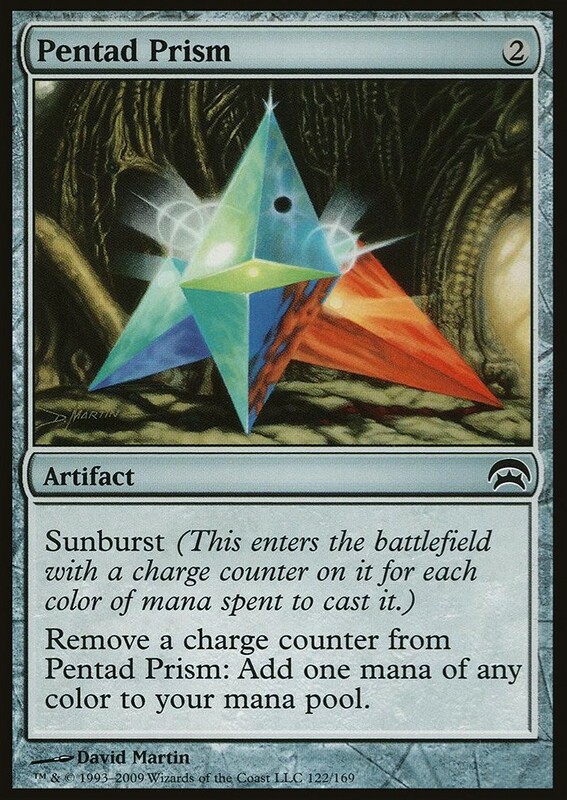 Pentad Prism in specific has added value as a tool for filtering mana when comboing or in a tight spot, and unlike Lotus Bloom does not have to be used all at once. 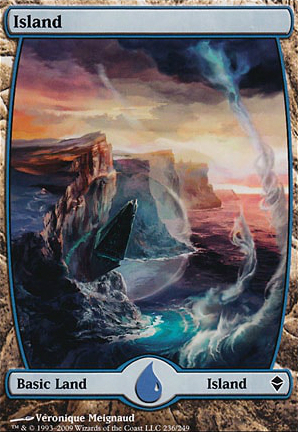 Another point with Pentad Prism to be aware of is that if opponent has Thalia, Guardian of Thraben on board then your prisms can potentially be played with Sunburst 3 instead of two, a point that makes those matchups slightly more interesting. Monkey is our way to win the game, providing the necessary mana to cast both Lightning Storm or Laboratory Maniac on the combo turn. With this in mind however, do not be afraid to expend Monkeys to play your cards, ideally make sure you have access to 2 in deck, however if you are facing down an Inquisition of Kozilek that can take your Phyrexian Unlife the turn before you play it then it can be correct to get it down before the discard, the same is true for Pentad Prism , not allowing your opponent to cut you off your acceleration. Fatal Push is our removal spell of choice. Of the three premier removal spells of the modern format: Fatal Push , Path to Exile , and Lightning Bolt , Fatal Push provides this deck with the most flexibility and has the least risk associated with it. It does it's job of removing problem creatures such as Ethersworn Canonist , Thalia, Guardian of Thraben , and Baral, Chief of Compliance . It shines most in our worst matchup, infect, where it is quite literally the difference between winning and losing. Echoing Truth provides a nice catch all answer to any potential problem we may face. It is not uncommon for one to play Echoing Truth to bounce something problematic like a Runed Halo preventing the deck from winning that turn. 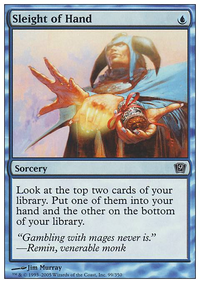 It can also be used to essentially buy a turn against decks such as infect by bouncing the Glistener Elf . 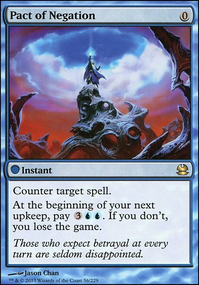 It is not uncommon to see 1 Echoing Truth in the mainboard and have an additional Pact of Negation moved to the side as a hedge against humans which without it is an auto-concession to Meddling Mage game one. In this deck Slaughter Pact is a free removal spell at all times, the upkeep trigger being able to be fizzled with an Angel's Grace (the same goes for Pact of Negation ). Slaughter Pact also opens up some interesting lines as with 6 mana available, lets say opponent is playing humans and has a Meddling Mage on board naming Ad Nauseam . 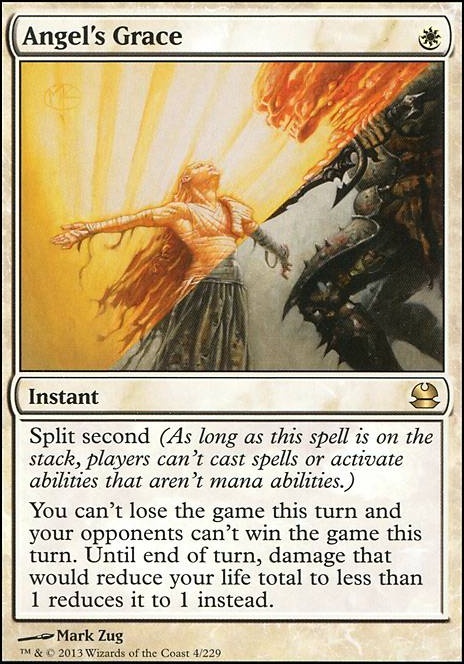 In this situation one can cast the Slaughter Pact removing the Meddling Mage and still have the 6 mana necessary to win that turn, so in addition to being free and a great catch-all removal spell, Slaughter Pact has the unique ability to allow a win at any given moment. Hurkyl's Recall is a card that is very situationally good in the modern format, it is one of those cards that is great against a group of decks and useless against everything else, in other words it is the quintessential sideboard card. For Ad Nauseam, I like playing the Hurkyl's Recall as my meta is full of affinity. With KCI gone there is an argument that there is no single artifact deck that needs to be meta-gamed for in modern. 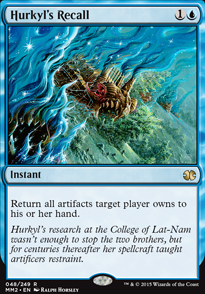 I would disagree in that Hurkyl's Recall can often be our only way out from under the Whir of Invention prison decks roaming around, and it remains good against affinity style decks which will always have their supporters. This being said, if you are not going to large tournaments and you know your meta to not have any or much affinity then it may be wise to consider dropping Hurkyl's Recall for something more relevant to your needs. I prefer Darkness to any other wrath available to the deck. The reason being that I find Darkness to be far more flexible and efficient. 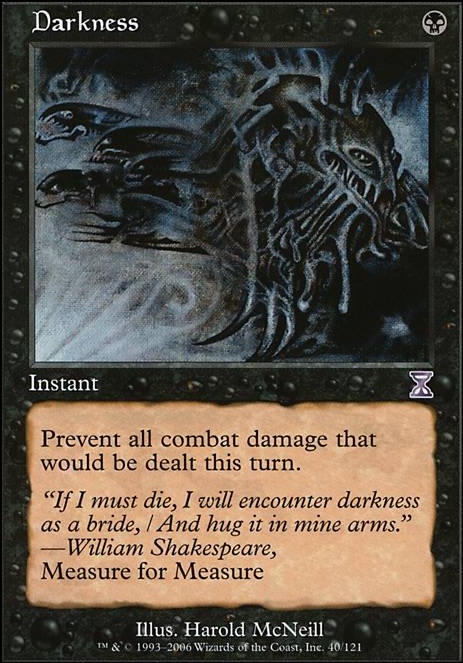 Unlike Bontu's Last Reckoning which has its drawbacks and is 3 mana, Darkness allows me that extra second of evaluation and has the potential to force our opponent's hand in certain matchups, i.e. Infect or Bogles. As a personal point of preference I believe Darkness is sufficient for this deck being both mana efficient and more of a surprise when played. The last pact to complete the playset with the 3 that are in the mainboard. This is simple, against decks with countermagic one wants as many Pact of Negation as possible, often against control the goal is to set up a turn where you can cast Ad Nauseam with at least 2 Pact of Negation for protection. The extra copy is mandatory for the deck, though if you choose to play the Echoing Truth in the mainboard, you want to make sure you have a playset of Pact of Negation available to you at all times, so in that scenario you will have 2 on board. A recent innovation in Ad Nauseam lists, Grand Abolisher has grown in popularity particularly for its ability to single-handedly win the Ad Nauseam player games against Bant Spirits, a deck that we have a notoriously bad matchup against as their best cards, namely Spell Queller and Mausoleum Wanderer match up well against Ad Nauseam. Unlike Teferi, Mage of Zhalfir which quite frankly is too expensive for this matchup and does not turn off vial shenanigans, Grand Abolisher provides the deck with the same effect but cheaper and more relevant to the spirits matchup while being almost just as good against control as Teferi, Mage of Zhalfir . 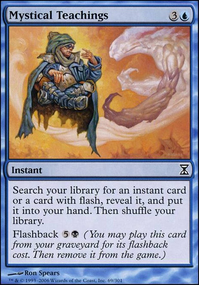 If spirits is a deck you suspect to be playing I would not play without at least 1 Grand Abolisher in the sideboard. 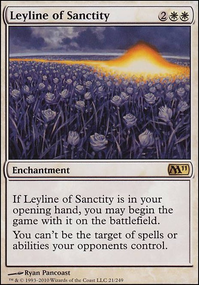 Leyline of Sanctity is truly the only mandatory sideboard card that the deck MUST play. 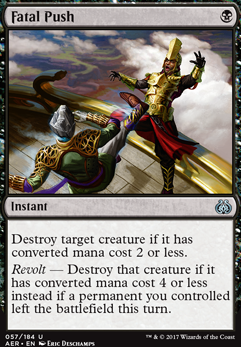 It is because of this card that decks like Jund and B/G Rock are fair matchups in my opinion. 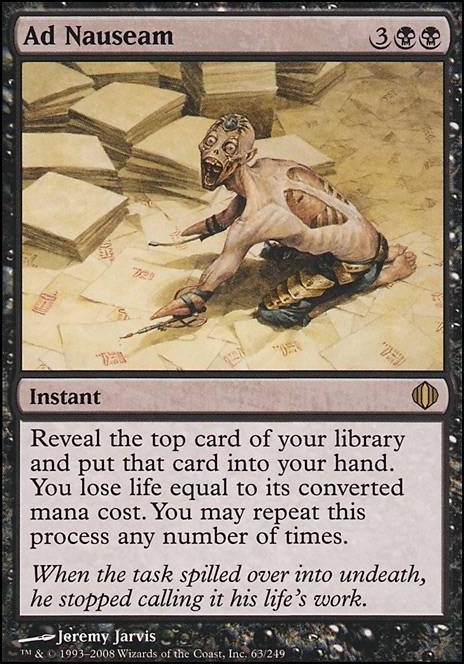 Essentially, when playing Ad Nauseam you get yourself into a mind-state where you think in terms of angles your opponent can attack you from; to that end there are three main ways people will do this, those being via pressuring your life total, discard, and countermagic. The fair to poor matchups are the ones that can attack you from two or more of these angles, hence why burn, which only attacks our life total, is a good matchup, jund, which attacks our life total and packs discard, is a fair matchup, and Grixis Death's Shadow, which attacks us from all three angles, is a poor matchup. Leyline of Sanctity effectively cuts off one of the angles from which we can be attacked, the discard angle. In essence this takes a deck like jund, which is favored game one, and makes the matchup more 50/50 or even favorable for the Ad Nauseam player as now jund has to remove the leyline before unlocking its second angle of attack, and until then is playing functionally as a sub-par aggro deck. This is why Leyline of Sanctity is a mandatory 4-of in the sideboard; it is important when playing Ad Nauseam to begin to think in this strange manner, to think in terms of these three angles and which options are available to opponent at any given time. A utility card with serious implications for the outcome of the game, Thoughtseize is a great card to have in the deck serving a few purposes. Firstly, it is great against our worst matchup in infect on the play, it is also our own safety net against some of the other combo decks in modern, notably storm. Besides this, it also makes the control matchup less stressful, as you will either get to see their hand or they will waste a counter preventing you from seeing, a win-win scenario for us in most cases. What is the idea of this section? Below I am going to try my best to list every possible card that Ad Nauseam could realistically play in its sideboard and provide a bit of information as to why you would consider playing it in your build. This will (hopefully) be updated continuously as new innovations are made, and if when reading this you know of something not included, leave a comment below. Bontu's Last Reckoning : Actually a fairly stock card in most Ad Nauseam sideboards, I personally am not a huge fan hence why it is not in my list although this should not take away from the card. It is an incredibly efficient wrath at the cheap cost of only three, with a draw back that potentially can be rendered obsolete with the artifacts in Ad Nauseam. It is a good card against any creature deck; notably humans which represents one of our worst matchups. 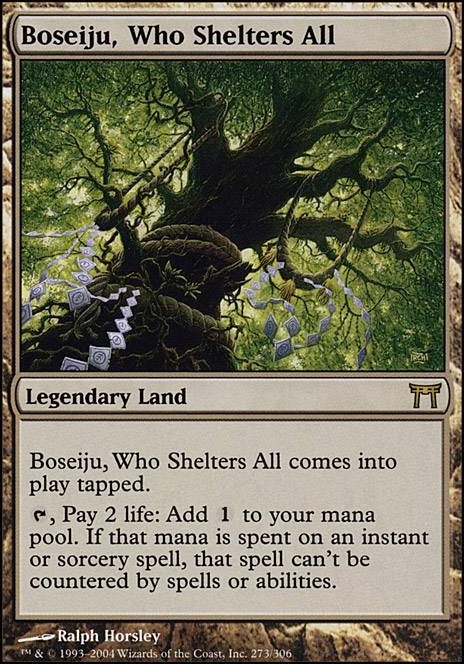 Boseiju, Who Shelters All : Great against control decks with access to a lot of counters, it has fallen out of popularity due to Field of Ruin but is still an option that has to be answered or we will win. Disenchant : A fine card in the right meta, if your area is filled with Blood Moon or other problem enchantments like Runed Halo , or Rule of Law , then this should be a consideration. Godhead of Awe : Great against most go-wide creature decks and an all-star against Death's Shadow variants. Patrician's Scorn : A free removal spell, Patrician's Scorn has proven to be a very flexible card out of the sideboard in the right meta (though is probably too narrow for most big tournaments). 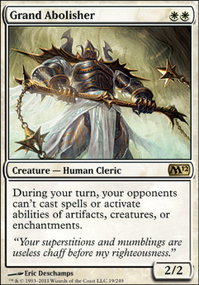 Unlike other enchantment removal, Patrician's Scorn has the ability to cause a win out of nowhere via casting it in response to Angel's Grace or Phyrexian Unlife removing problem enchantments. Very meta-dependent card however. Teferi, Mage of Zhalfir : Amazing against control, in this matchup where games tend to go long Teferi, Mage of Zhalfir can often be the make or break point, flashing it in on opponent's end step with the mana available to combo and win the next turn, opponent has an onus to counter the Teferi, Mage of Zhalfir as if they do not they lose, if they do they can also lose however as they are down a vital counter and mana. This is where the card shines, however it has very few applications elsewhere. Also worth noting is it can be grabbed with Mystical Teachings . Sphinx of the Final Word : Good against control, and decent against spirits if you can get to it, but nothing else, if it sticks the game is functionally over, if it does not then mana has been wasted by our opponent to deal with it. Inferno Titan ? : This one goes over my head, I only include it because Xavier Biron piloted a list with three in his side to a 17th place finish at GP Toronto 2019, however his reasoning escapes me. It doesn't feel particularly good against the most popular decks at the tournament (Izzet Phoenix, GDS, and 4-color Prison) so I'm a bit unsure as to why it is played. It feels like it would be fine against Humans or Spirits however I cannot say definitively having never played the card. Grave Titan : Apparently the worse of the titans, Grave Titan traditionally fulfills the role of the backup plan in the sideboard. We have no trouble getting to 6 mana and with our opponent likely off removal Grave Titan can quickly take over the game. I believe part of the reason it has fallen off in popularity is the move to Assassin's Trophy making it harder to fade removal, though in reality the deck has just shifted to be more focused on the combo. 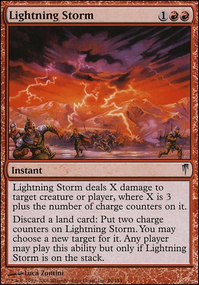 Lightning Storm : In the not too distant past it used to be fairly common practice to run an extra Lightning Storm in the sideboard for when Laboratory Maniac was bad or we just needed an extra win-con. It is still possible to do this if one wishes. Dragonlord Dromoka : Another control finisher option, Dragonlord Dromoka can also very reliably end the game on its own if we cast it. This is a personal favorite of mine, the mana can sometimes be hard, but if your meta allows it then this is a very good option. Wear / Tear : Great in its flexibility, being able to remove problem cards such as Eidolon of Rhetoric , Stony Silence , Blood Moon , Chalice of the Void and more at a very efficient rate. Fragmentize : Efficient enchantment removal with a draw back that is virtually non-existent. Timely Reinforcements : Hard to evaluate, on one hand has the ability to steal games out of nowhere, buying often 1-2 extra turns and providing 3 whole blockers. The argument against it is that it is not better than simply playing a wrath in most cases. Beautiful in foil. Supreme Verdict : A wrath that can't be countered used to be our best friend, now however, while Supreme Verdict is very good, people have moved to the less expensive Bontu's Last Reckoning , as Supreme Verdict , in one of the most relevant matchups, can still be got by Spell Queller . I am personally a fan of this as the wrath of choice however as it forces our opponent to have exactly Spell Queller , and is a less likely Meddling Mage name. Wrath of God / Damnation : Functionally these cards are the same as variations on a basic wrath effect, the choice between them would boil down to how you built your manabase. Generally, you want to split this with another wrath as Meddling Mage protection. Vendilion Clique : Both a great tempo play and owing to flash a very flexible way to check our opponent's hand before we combo. Painful Truths : Decent against grindier and control decks, it often reads draw 3 cards for our deck which is ideal in these kind of games. Swan Song : An extra counter for control, and an answer to decks packing problem encahntments (here looking at G/W company decks with Eidolon of Rhetoric ). Path to Exile : The most flexible removal spell in modern fulfills the same role here, it is efficient and can hit virtually anything, and when Amulet Titan is popular it is the right choice. When Arclight Phoenix is king however, Fatal Push functions better, matching up with Thing in the Ice Flip and Pteramander , and not ramping them to Crackling Drake . Duress : Serves the purposes we want for most matchups without paying life, can be great against storm, and is an extra tool for the control matchup. Gigadrowse : Can buy an extra turn at a less painful rate being able to cast it at the beginning of combat or at our opponents upkeep to stunt their development. Also noteworthy is its ability to dodge Chalice of the Void due to replicate. Settle the Wreckage : Admittedly, I have been putting off seriously testing this card personally. It is a flexible wrath type effect that, though it has a downside, is perhaps the most flexible way of dealing with a large board, allowing us to wait until attackers to make our decision on whether we need to wrath; a fact that can catch some players being greedy for the win. The drawback with it is that, like with all wraths, it gets got by Spell Queller , and it ramps our opponent to potentially something worse. It is however, very good against decks like Phoenix and Dredge. Keranos, God of Storms : A sort of pet card for myself, and one that may be even a bit better when decks are running Surgical Extraction in the mainboard. Keranos, God of Storms is strictly a plan B sideboard card, and to this end is best against control decks, or slower creature decks (bar GBx due to Assassin's Trophy ). His problems largely boil down to the same point, which is that he is very slow and doesn't actively hate on any matchups. However, in a vacuum if you are running a plan B, he remains my first choice out of nostalgia more than anything else. I love Ad Nasueam and I hope that this will serve to inspire many others to take up the deck! If you like the deck please give this page an upvote! THANKS FOR READING!!! Upvote+1 THANKS FOR READING!!! Upvote+1 THANKS FOR READING!!! Upvote+1 THANKS FOR READING!!! Huge thanks to Chasmolinker for helping out with the page design. Check out his page here! First off, thanks to all of you who have suppoted this deck and the primer over the past year; as well as those who leave comments and ask questions, above all else keeping me sharp. I am so happy to see that the deck I love is getting some support from the community. I thank all of you once again and say: onward to 50! So I played in a rather small Modern Constructed tournament (field of about 10) this past week and I'm only now getting the chance to record it here; overall a weird tournment in its conclusion. I haven't seen Hollow One in a while so this really was a refresher. Game one my opening hand was almost perfect, the problem being that I had Lightning Storm in hand. Because of the strength of the hand I decided to risk it (hand was: Seachrome Coast , Angel's Grace , City of Brass , Pentad Prism , Serum Visions , Lotus Bloom , Lightning Storm ). My opponent, on the play, responded by playing turn one Burning Inquiry . Here I got very lucky, the Burning Inquiry drew me into Ad Nauseam and I didn't discard anything relevant and from there cruised to victory as they lacked any disruption. The Echoing Truth is questionable though I do like it as it can strand Hollow One or Gurmag Angler in hand, its a point of preference. Game two went similar to game one, although he lacked discard and I was able to essentially autopilot to a turn 5 win after preserving my life total on turn 4 with an extra Angel's Grace . This was really a case of dumb bad luck on my part, game one went as most in this matchup do, the Dredge deck lacks any meaningful interaction game one and I was able to win on turn 4 without much resistance. Game two I kept an average hand at best but drew into the combo, the problem was he found both sideboard Thoughtseize and had the clock to back it up, unfortunate but sometimes happens. Game three I kept a questionable hand at 6 that needed one more land to win, long story short, I didn't find it. Overall the lose was my own fault, I should have mulled game three but decided against it not wanting to go to 5. Dredge remains a good matchup regardless of the tough loss however. Seeing the pairings for round three I couldn't have been more excited to be paired up with Burn; Burn is a great, but always be aware that it is easily loseable, matchup. Game one was a turn four kill curved out behind turn 3 Phyrexian Unlife , a card with Angel's Grace that has the ability to invaliadate what Burn is doing. With the addition of Leyline of Sanctity the deck essentially has 12 hate cards for burn, 8 of which also win the game; this player was correctly not playing Wear or splashing green (I say correctly as those would be wasted slots against the current meta for the most part) for Destructive Revelry . Game two, with Leyline of Sanctity , I ended up losing noentheless as I couldn't find a land to win. I got down to one life off of creature beats (he was at 4 from hitting himself with burn spells), he played Eidolon of the Great Revel , I drew the land on my next turn but was dead to the trigger if I tried to win. Game three I again started with Leyline of Sanctity , this time I was able to autopilot to a turn 4 win. At the end of the night I sat 2-1 which by all measure should have put me in the 2nd-4th range however, remember that Dredge player, he had to run so dropped at 2-0, and one other previous winner had dropped after round one, meaning I got the win. I took the prize but I really should have won just off of beating Dredge; this store gives out free packs as the prize along with the promo, I took an Hour of Devastation pack as a joke, I pulled a Hollow One taking the night full circle. A good haul, I'm very excited to finally have those Simian Spirit Guide 's, however unfortunately the fourth Ad Nauseam continues to allude me.